In an Old West populated by centaurs, mad mystical cow rustlers, and bovine missionaries, the wise-cracking, hard-drinking demon girl Kit — armed with an otherworldly gun — is out for revenge against her former outlaw gang. Matt Speroni, who also handles art duties on the kung-fu webcomic How I Killed Your Master, writes and draws this supernatural western. 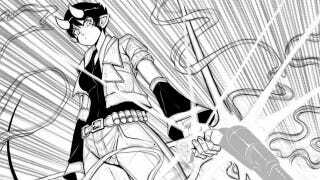 Kit is young demon outlaw, who, in the comic's opening pages, has just been shot. The attack isn't fatal, but Kit suspects that her former boss, the outlaw queen Jeanne Noelle, had something to do with the two holes in her back. So when she's offered a gig to bring Jeanne to justice, she jumps at the opportunity. Unfortunately for Kit, this means partnering with another former gang member, the treacherous Liz. But Liz has a mission of her own, one involving a ring that makes its wearer both bulletproof and dangerously insane. Soon, Kit has to contend with a bird-winged assassin, a cow-headed "Mooman" missionary who shares Kit's love of terrible puns — if not her love of drinking and violence — and the nagging feeling that she at once needs and can't trust Liz. The Dreadful is a neat mashup of western gunfights and magical, manga-inspired zaniness. And there are plenty of hints of further worldbuilding and intrigue ahead. What happens when a demon, a deceitful gunslinger, and a four-stomached missionary take to the road? We'll have to wait and see.